The U.S. Commission of Fine Arts will be closed on Wednesday, 5 December 2018, in observance of the National Day of Mourning for President George H.W. Bush. Visit www.opm.gov for more information. President Donald J. Trump has appointed Justin Shubow to serve a four-year term on the U.S. Commission of Fine Arts in Washington, D.C.
Alan R. Novak (far left) shown in 1984 with fellow Commission members at the CFA’s former offices at 708 Jackson Place on Lafayette Square. 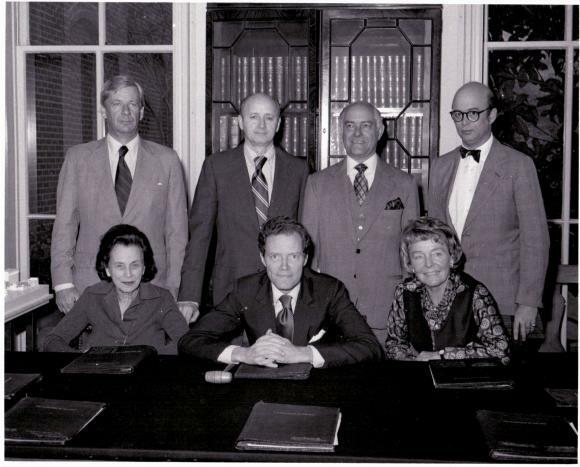 Left to right: Alan R. Novak, Sondra G. Myers, Edward D. Stone Jr., Chairman J. Carter Brown, John S. Chase Jr, and Walter A. Netsch.